velocity of turbulent motion (see Phil. Mag. lor October 1887, p. 350). In all investigations the two velocities come out of the same order: and in FitzGerald’s collected papers, No. 53 and No. 91, the two velocities can be identical tor a certain arrangement of turbulence (cf’. pp. 259 & 256). On page 457, FitzGerald expresses his tentative opinion that the hypothesis that “ the ether is a turbulent liquid has great possibilities underlying it.” And, again, on p. 486, “ there seems very little more besides interpretation of symbols to make a turbulent liquid a satisfactory explanation of the structure of the ether/' Some assurance of stability may also be needed. Many things show that any granular structure which may thus be possessed by the ether must be of a fineness incomparably minuter than any dimension associated with the material units on which we can experiment. In fact, the ether may quite well contain a linear dimension of the order 10"30 or 10-38 centim., and an energy of 1030 or 10355 ergs per cubic centimetre (Phil. Mag., April 1907, p. 493). The calm self-sufficient way in which it sustains all our stresses, and transmits all our energies, shows that anything we can impose upon ether is as far from perturbing it, or calling out even second orders of small quantities, as the slight bias of an ordinary draught of air is from perturbing the normal motion of the molecules which compose it. A bullet in air and an electron in ether can, however, attain perturbing velocities ; and the fact is bound to be instructive when increase of mass with speed is fully assimilated and its mechanism understood. As said on p. 490 of the Phil. Mag. 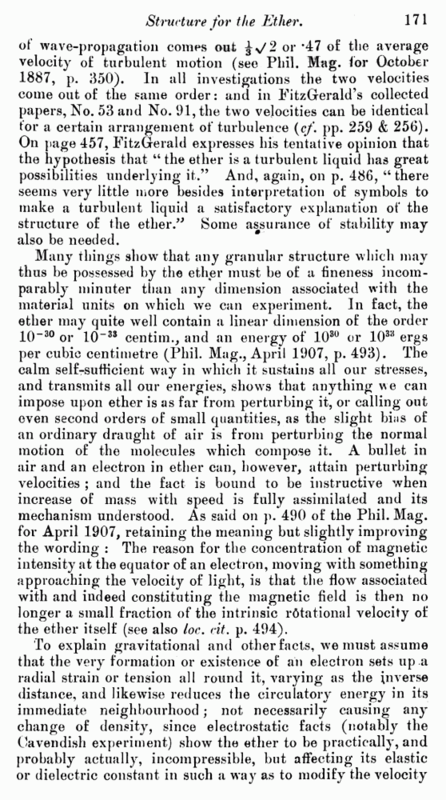 for April 1907, retaining the meaning but slightly improving the wording : The reason for the concentration of magnetic intensity at the equator of an electron, moving with something approaching the velocity of light, is that the flow associated with and indeed constituting the magnetic field is then no longer a small fraction of the intrinsic rotational velocity of the ether itself (see also loc. cit. p. 494).